About 45 kilometers from here, in the département of the Indre just south of Valençay, is the small town of Levroux. In the center of this unassuming place is a large church, called a collégiale, that is quite impressive. 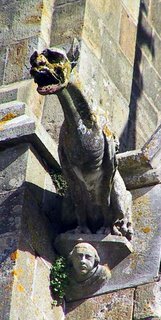 Construction on the collégiale began in the late 12th century, and parts of it were still being worked on at the end of the 15th century. To my eyes, the building looks mostly of the romanesque style, but its flying buttresses and interior ribbed vaults illustrate the ongoing transition to gothic style during this period. 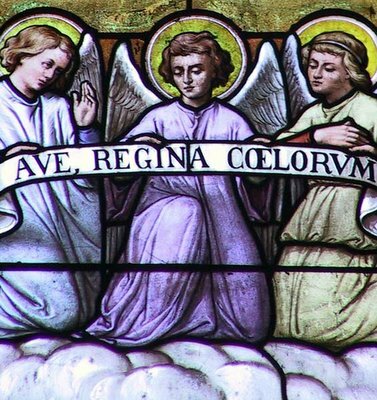 The sunny day made for an impressive show of stained glass inside the church. Not only were the windows brilliantly colorful, but the interior of the church was lit up, showing off details that we may not have seen on a cloudy day. 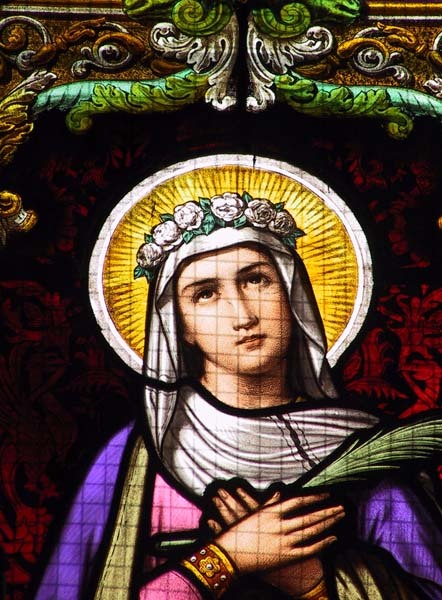 More stained glass in the collégiale at Levroux. Of course, what's a good church without a gargoyle or two? This guy looks menacing enough. I wonder what the poor fellow below him is thinking? We had a great time "discovering" Levroux. A little north of there is a small renaissance château called Bouges. We visited that on the same day. Look for a post in the near future about that visit. 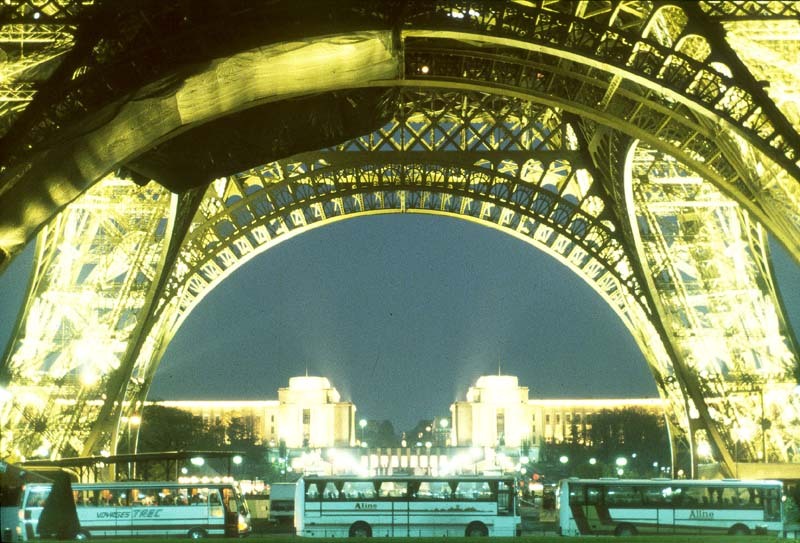 And yes, I know, the Eiffel Tower/Invalides Paris tour is still in the works. 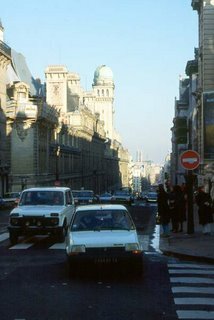 1981 : Ah, très chic. 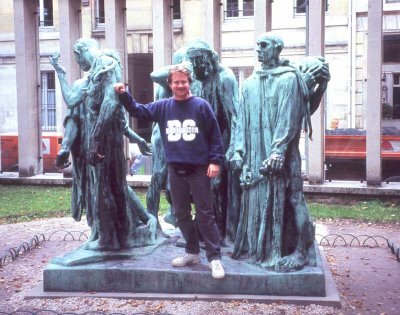 1994 : How come I'm the only one getting older, here? 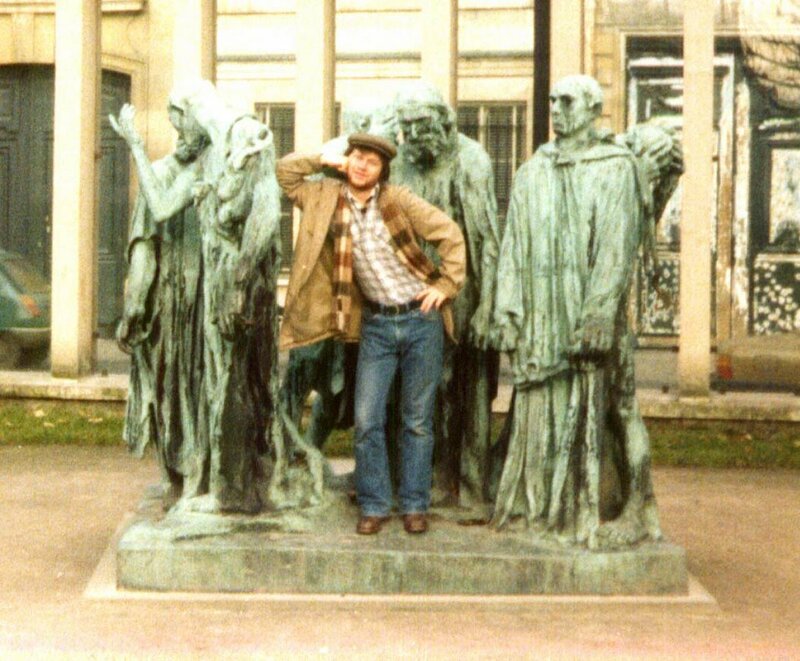 The top photo is from 1981, when I was a student in Paris. It was taken with a Kodak 110 instamatic. Remember those? 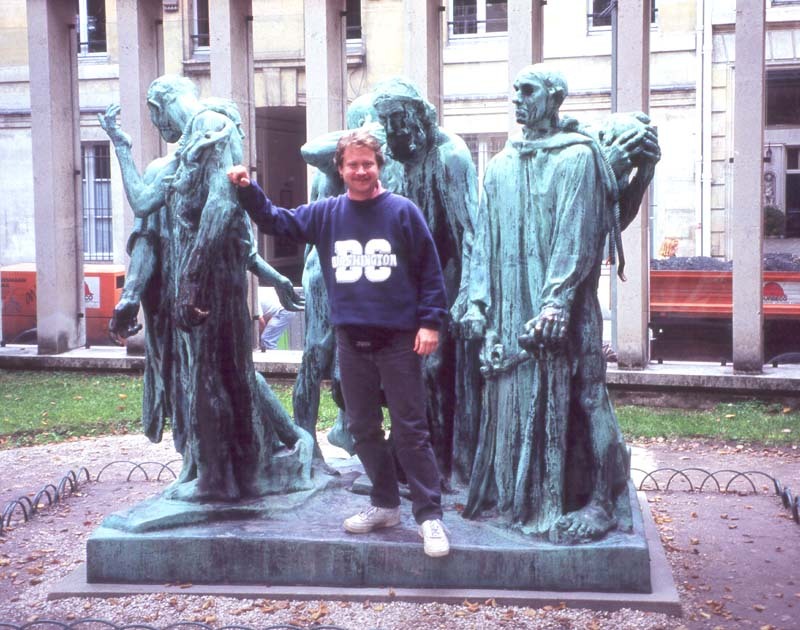 The bottom photo is from 1994, when I was a tourist in Paris. It was taken with a 35 mm Minolta SLR, with color slide film (probably Ectachrome). I'm thinking that this spring or summer I'll have occasion to visit the Rodin Museum again and do an update photo - the timing will be about right. The next photo will be with a digital camera, to be sure. I've always felt that I only get the sense of the size of this thing when I'm standing near it, or under it. These two pictures almost convey the immensity of the tower even though I'm still a good distance away. I've been told, and I don't know if it's true, that the area inside the four feet of the Eiffel Tower is equal to one hectare. That's 10,000 square meters (100 x 100 meters), or 2.47 acres. One hundred meters is about the length of an American football field. If someone else has heard this, or otherwise, please leave a comment. Remember, these photos were scanned from color slides, then processed in Photoshop. I'm not the most skilled Photoshop user, but I'm trying to get the colors to match the originals as closely as I can. I haven't taken slides in many years, having migrated over to digital, and my slide projector is no longer working, so the scanner gives me an opportunity to not only look at the old slides again, but to digitize and share them. Ain't technology grand? 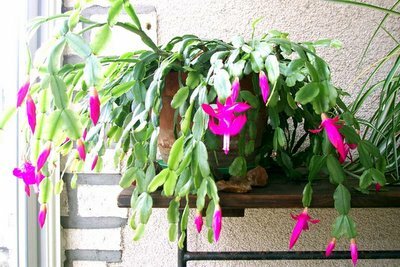 Our "Presidents Day" cactus blooming on the sun porch. We enjoyed a nice Friday out yesterday. First, lunch at our neighbors' house across the street. Apéros, salade de mâche and fish terrine, then confit de canard with sautéed potatoes. Then, in the evening, drinks and nibbles at the home of some British neighbors, Janet & David, with friends/colleagues of theirs, Martine & Bruno, and Olivier. They're all in the real estate business here in St. Aignan together. We had a good time trading stories about culture, language, politics, wine and more, and got home around 12:30 am. 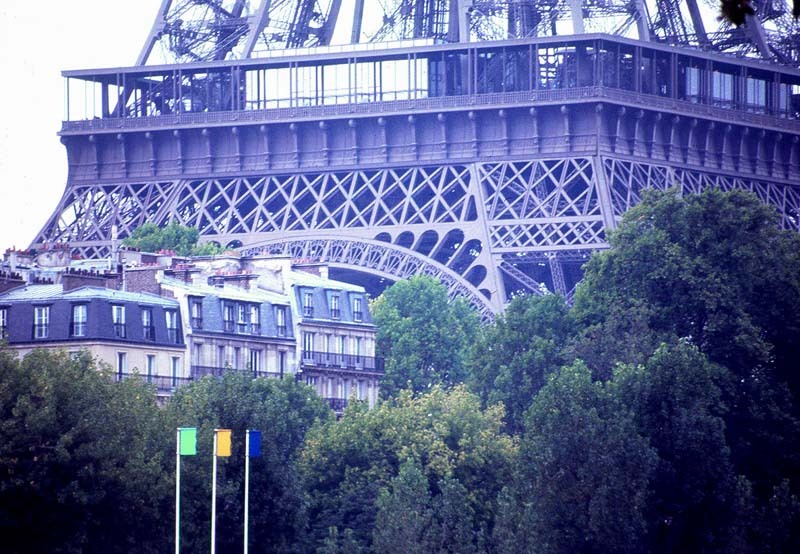 You don't often see the Eiffel Tower taken from this vantage point in the guide books, or at least not with the towers of the Front de Seine complex in view. 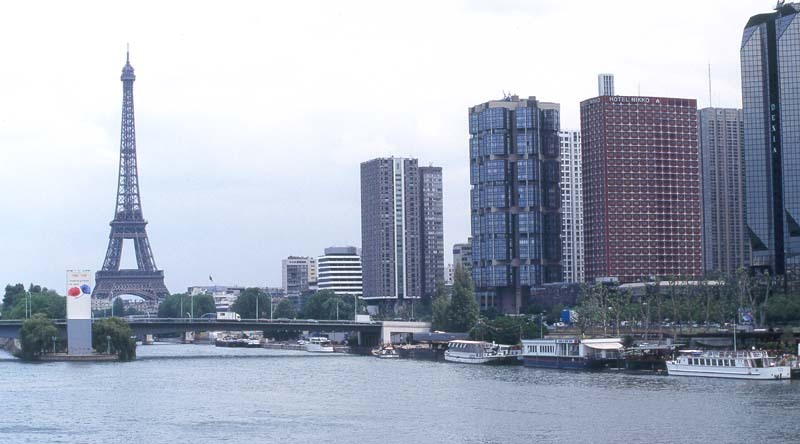 Just to the left of the tower's base (in this photo), on the downriver point of the Allée des Cygnes, you can see the pedestal of a statue but the statue is missing. This is home to a smaller version of the Statue of Liberty that was, when this picture was taken, being temporarily displayed in Japan. It has since returned. The bronze replica of Bartholdi's and Eiffel's larger statue in New York Harbor was the gift of Americans living in Paris in 1889 on the occasion of the Paris Universal Exposition - and the centennial of the French Revolution. Ok, I know this is not about France. 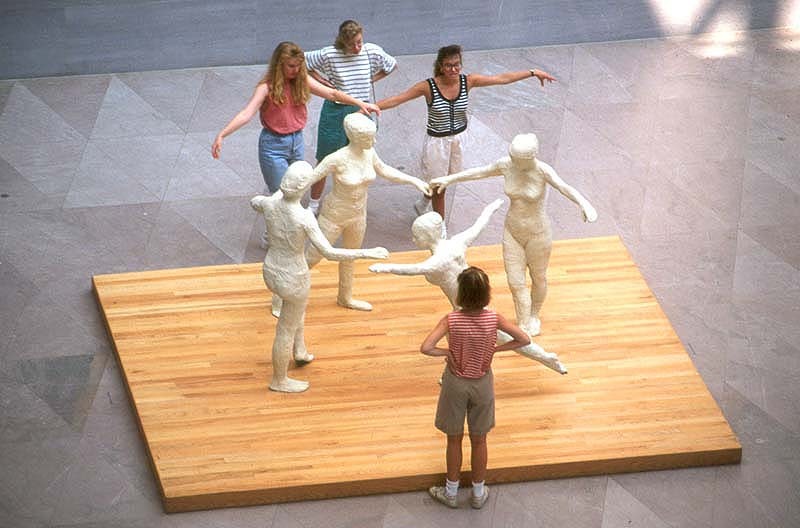 I took this photograph in the East Wing of the National Gallery of Art in Washington, DC, in 1990, I think. I don't know who the women are, but as I crossed a bridge on one of the upper floors, I noticed them below interacting with the sculpture. The sculpture reminds me of Degas (hey, he was French! 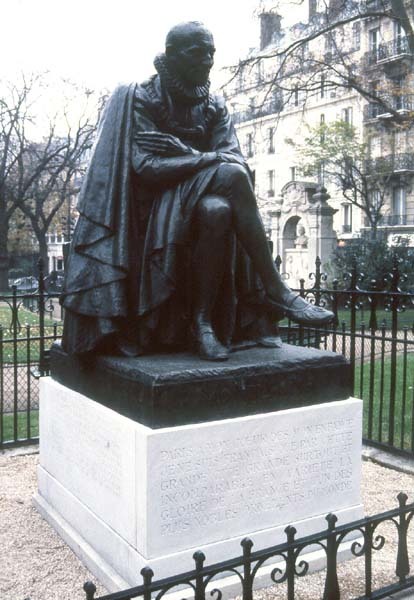 ), but I can't find any reference to it online, so I don't know what work it actually is or who sculpted it. My apologies. If any of you recognize it, please leave a comment (by clicking on "comments" at the bottom of this post)! The fifth and final tour in the Walking Tours series will be the Eiffel Tower/Invalides neighborhoods and it has yet to be written. Perhaps this week... stay tuned! We've been feeling a bit down lately, probably because of the short gray days and cold temperatures we've been experiencing this past month or so. We're not out outside much, except to walk the dog and go to the grocery store. I wrote what follows in 2004, during our first winter in France, and it kind of sums up the way we're feeling now. We know it's only temporary. Winter is a bit depressing right now. The weather has been cold, then warm, then cold again. It’s not that harsh bitter cold that makes your breath freeze on your mustache and makes you feel as though your nostrils are freezing shut every time you inhale. No, it’s just cold enough to make it uncomfortable to be outside. It snowed a little and it rains frequently. We feel house-bound. The electric bill arrived, finally, after months of practically paying nothing due to the estimation-based billing process that EDF uses. The electric company reads the meter only twice a year. They estimated our monthly consumption based on the first bill when we hadn’t lived here very long and didn’t have any appliances. Then, at the end of December, the big bill hit based on the meter reading. It was over 350 euros. I was expecting it, thanks to the electricity-estimating spreadsheet I had built, and I’ve now signed up for self-meter reading via the internet. But still, our consumption of kilowatt hours was a bit higher than we’d like. Now, in the new year, we’re keeping lights off, not keeping the water heater on in the daytime, and trying not to run the washing machine, dryer, and dishwasher except on overnight cycles. Electricity is about half price between midnight and six in the morning and the appliances are equipped with delayed starting features. We run out of hot water sometimes in the afternoon. Our damp clothes are hanging in the utility room. I skip showers every other day to save hot water. The heat is working well, but we’re using about 12 liters of fuel oil a day. We’ve also got the furnace on a timer, so the heat comes on at 7:30 am and goes off at 8:00 pm. Since neither one of us likes the heat on at night, that’s a good thing. We also have it go off for 2 hours mid-day. On cold days, those 2 hours are enough for the house to cool down significantly. The furnace keeps the water hot while it’s “off,” it’s just that the hot water doesn’t circulate to the radiators and cool down. This shortens the time that the furnace needs to burn. We have about 2 weeks of fuel left before we need to order another 1,000 liters. On Saturday, I noticed that when I flushed the toilet, the water was taking a long time to drain out. Of course, this made me a bit suspicious. I checked the level in the holding tank, and naturally, it was full. This came as quite a surprise since it’s only been one month since it was emptied and we had been getting it emptied every two months. We’ve concluded that the heavy rains we had in the past week (a month’s worth of rain in one week, according to the weather channel) leaked into the tank and filled it up. For three days, while waiting through the weekend and then for the pumping company to fit us in, we have not had use of the toilet. We’ve been peeing outside and in the bidet, and have used a bucket and shovel (to dig burial holes) for the more serious waste issues. The hard rains of the past week brought another revelation: the windows on the western side of the house leak. This is the only time they’ve leaked in six months (we had a hot, dry summer), but the wind-driven rain came right into the house through the window joints and spilled down the walls. 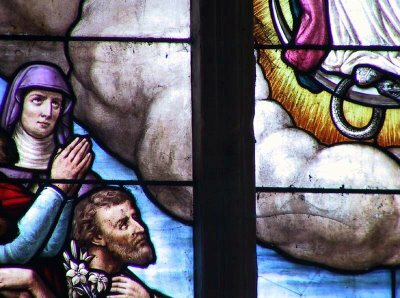 We cleaned up and shut the shutters, which did the job of keeping the water out, but which also had the unpleasant effect of making the house feel even darker on dark, rainy days. The wood-framed windows are old and have warped. They need to be replaced. This is where I hear that cash register ringing sound in my head – KA-CHING! Actually, all of the windows in the house are single-paned and leak air, so replacing them over time is something that we’ve talked about doing. And the western windows are in the two bedrooms and the bathroom, they take the brunt of the weather, and it seems to make sense to change them first. So I suppose that’s what we’ll do. News from the states is not all that uplifting. The dollar, while regaining some ground last week, has fallen against the euro to depressing levels, and the U.S. seems content to keep it that way. Europeans are starting to get nervous about the situation, but it’s not clear what, if anything, they can do. The current national political discourse does not bode well for reasoned thinking on social issues. A right-wing member of congress has introduced a bill to ban seven words from television (someone, please bring George Carlin back). An action-movie star as been installed as governor of California. San Francisco narrowly escaped a mayor who comes from so far left of center that he’s nearly on the right. Starbucks coffee is not content to be an international mega-corporation without expanding in to Paris. The U.S. looks like a culture out of control from the outside. On the bright side… the days are starting to get longer, there are buds on the trees, and bulbs are coming up all over. Hunting season ends in a week or so; meaning no more gunshots out in the vineyards on Sundays. And, our good friend, Sue, will arrive in Spain next week and we’re starting the planning process for a trip down to see her, perhaps as early as the end of February. Spring will be most welcome. I’m looking forward to opening up the house and letting the air flow through it. I’m looking forward to shorts and tee shirts. I’m looking forward to hearing the leaves on the trees rustle in the wind. I’m looking forward to digging in the garden and planting vegetables. I’m looking forward to light until nearly ten at night, and the bats feeding on insects at twilight. I’m looking forward to being able to sit outside at night and watch the stars. PS. By the way, we did get the windows replaced and it made a great difference. We've also painted most of the rooms in the house and it feels much more like home that it did that first year. Still, the cabin fever sets in for about a month between mid January and mid February; and we had more snow this winter than in the last two - it even stayed on the ground for a while, accentuating that closed-in feeling. Still, we know spring is near now. 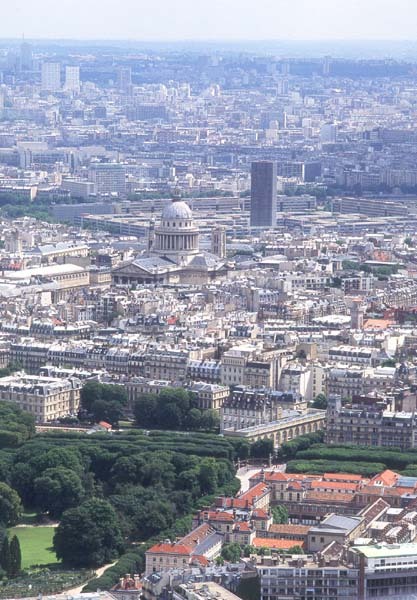 When the Romans inhabited Paris around the 3rd century, they located their settlement on the left bank of the Seine, directly across from the islands, on the rise we know today as the Montagne Sainte Geneviève. Here were the Roman forum, baths, and theater and amphitheater, as well as the characteristic Roman grid-patterned streets and an aqueduct. Some vestiges of the Roman town are visible today: the baths on the site of the Hôtel et Musée de Cluny and the Arènes de Lutèce on the rue Monge are two of the more prominent. 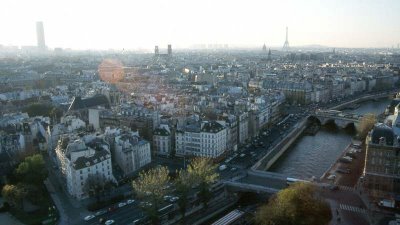 About a thousand years later, in 1215, Pope Innocent III authorized the foundation France’s first university in this part of the city. 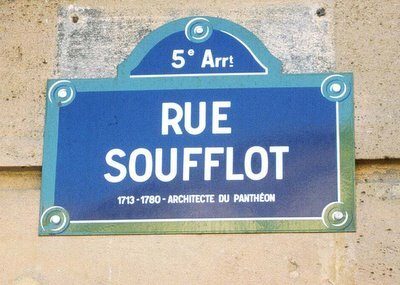 Since then, the Latin Quarter (so named because Latin was the language of education until the 18th century) and the Sorbonne have constituted the primary center of learning in Paris. Le Quartier Latin and beyond. The Place St. Michel is in the center-right of the photo, on the left-hand side of the arched bridge. Start your tour in the Place St. Michel (métro: St. Michel) directly across from the Ile de la Cité. 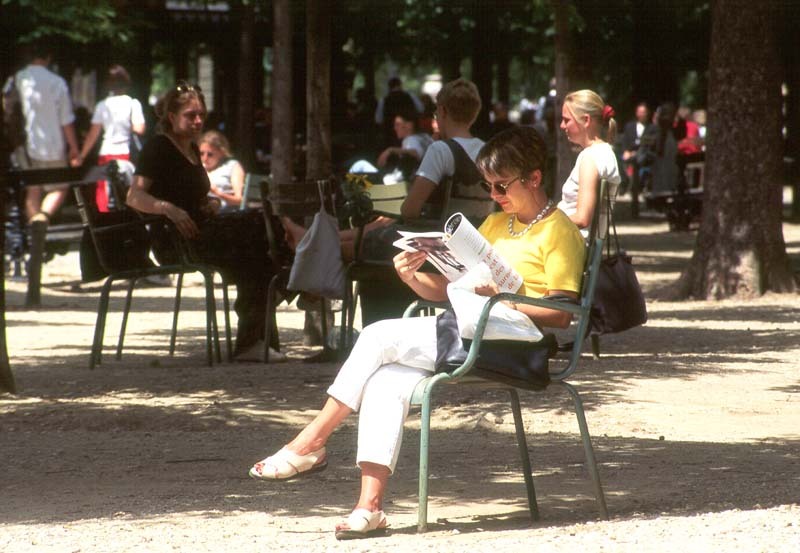 The bustling square is full of tourists and the cafés that cater to them, but it is also flanked by new and used book stores that recall the quarter’s relationship with the Sorbonne. Here is where, in May 1968, protesting students clashed with police over university policies and general discontent with the French government, setting off a series of marches and strikes throughout the city and the nation. 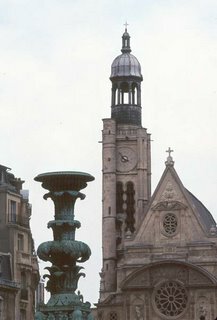 Completed around 1860, Gabriel Davioud’s fountain with a sculpture of Saint Michael slaying the dragon was commissioned by Baron Haussmann to mitigate the impact of a large bare wall facing the Place. Walk south (away from the river) up the Boulevard St. Michel. As you cross the Boulevard St. Germain (a major traffic thoroughfare from west to east) you will see on the southeast corner an exposed archeological dig behind large iron fences. These are the excavated ruins of the Roman baths originally built on the site at the beginning of the 3rd century. Less than a hundred years later, the baths were destroyed in a barbarian attack on the city. 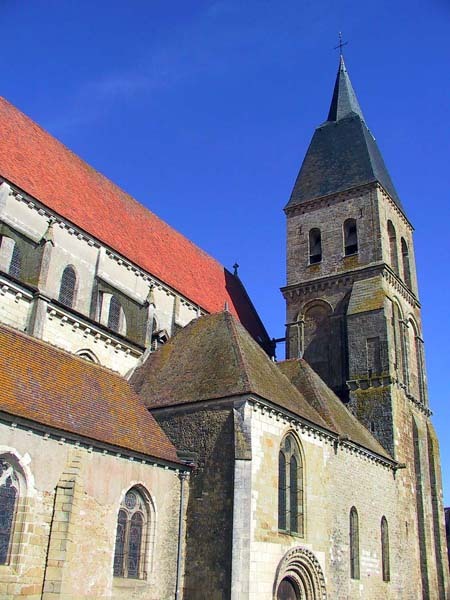 Much later, in the 14th century, the site was purchased by Abbot Pierre de Châlus of Cluny-en-Bourgogne. 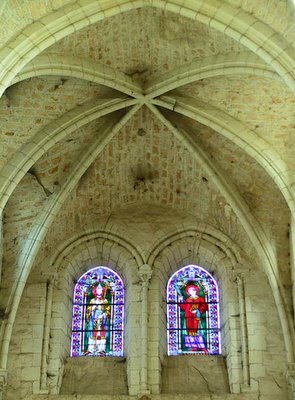 There he built an abbey to house monks from Burgundy who traveled to Paris and the new university. In the 19th century, the building was converted to a museum and today houses a collection of medieval art and artifacts. Visitors can also tour the excavated Roman baths. From the Cluny museum’s entrance just off the rue des Ecoles, walk south along the narrow rue Victor Cousin. The buildings of the Sorbonne rise up on the left-hand side. 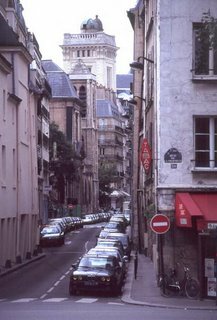 About halfway to the rue Soufflot you will pass, on the left, the Eglise de la Sorbonne, a 17th century church that is sometimes open to the public for specific exhibitions. 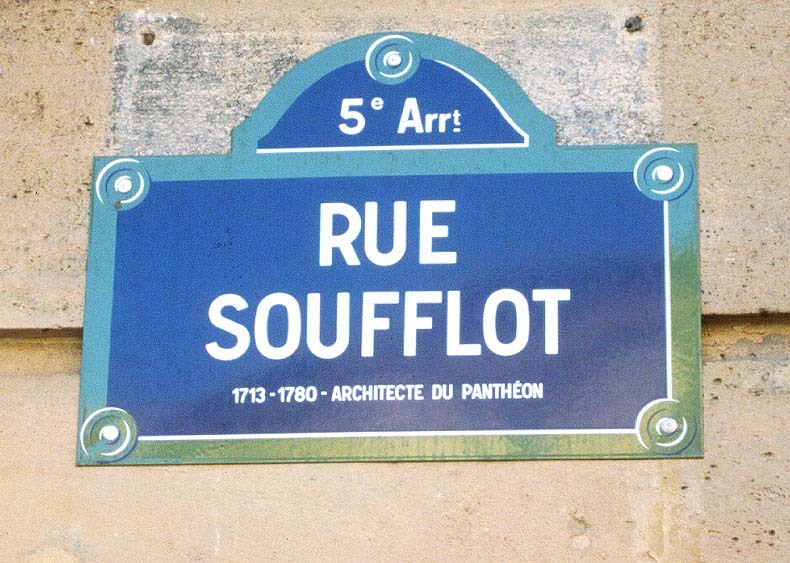 Continue along the rue Victor Cousin to its intersection with the much broader rue Soufflot. To the right (west) you can see the Luxembourg Gardens. To the left, the temple portico and soaring dome of the Panthéon dominate your view. 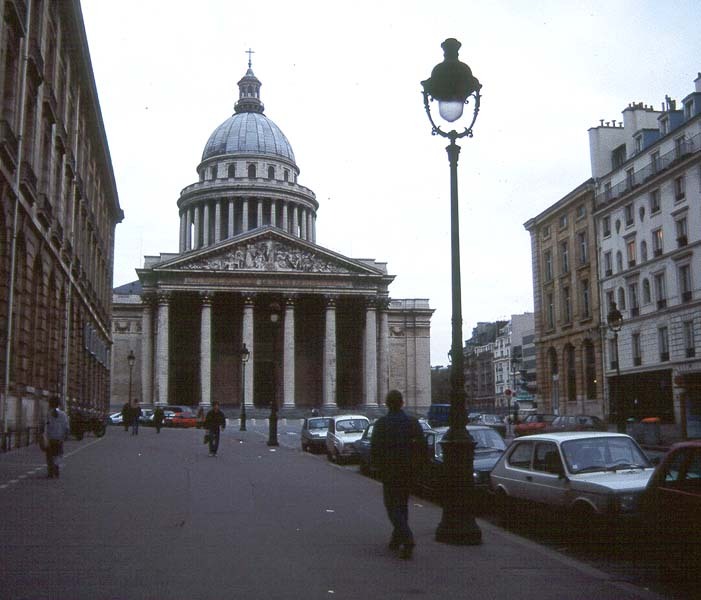 Walk up the rue Soufflot (named after the building’s architect) to the Panthéon. The rue Soufflot and the Panthéon. The building was commissioned by Louis XV in 1744 to honor Sainte Genviève, the result of a vow he made while suffering a life-threatening illness. Louis XV survived, but the monarchy didn’t. The church’s construction spanned the downfall of the monarchy and the turmoil of the French Revolution. Completed about 1790, the huge church was quickly secularized and designated to serve as the final resting place for the great heroes of the Revolution. Since then, the Panthéon has received the remains of a great number of honored French politicians, military leaders, scholars and writers, including Voltaire, Jean Moulin, Jean-Jaques Rousseau, and Victor Hugo. Behind the Panthéon, on the Place Sainte Genviève, is the church of St. Etienne du Mont (right). The current building was consecrated in the early 17th century. It replaced an earlier church which was part of the Ste. 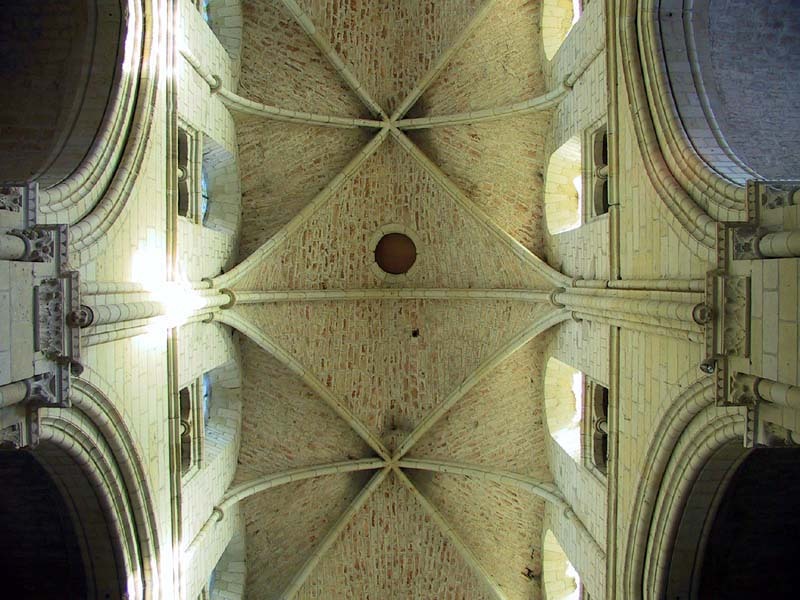 Genviève abbey complex on the site. 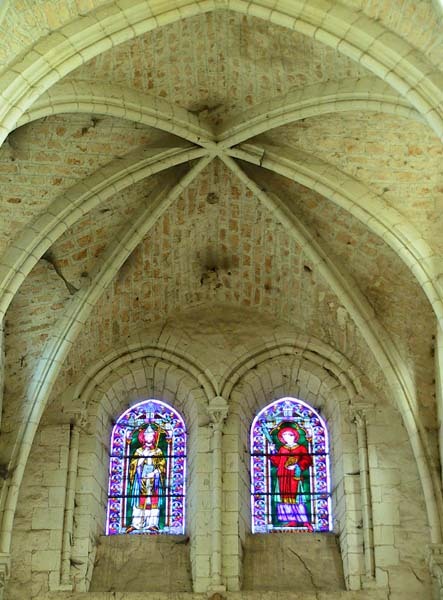 The church is a mix of gothic and renaissance styles and, in addition to standing as a shrine to Saint Genviève, contains the remains of the French writers Racine and Pascal. Stand in the Place Ste. Genviève facing the church, then walk along the right-hand side of the church into the rue Clovis. Turn right and walk down the rue Descartes to the Place de la Contrescarpe. Here you are the top of the rue Mouffetard which descends the southern flank of the Montagne Ste. Genviève – you can really get a sense of the topography here. This is one of Paris’ many market streets and along it you will find butchers, cheese shops, bakeries, the shops of small grocers and wine merchants, along with restaurants and nightclubs. 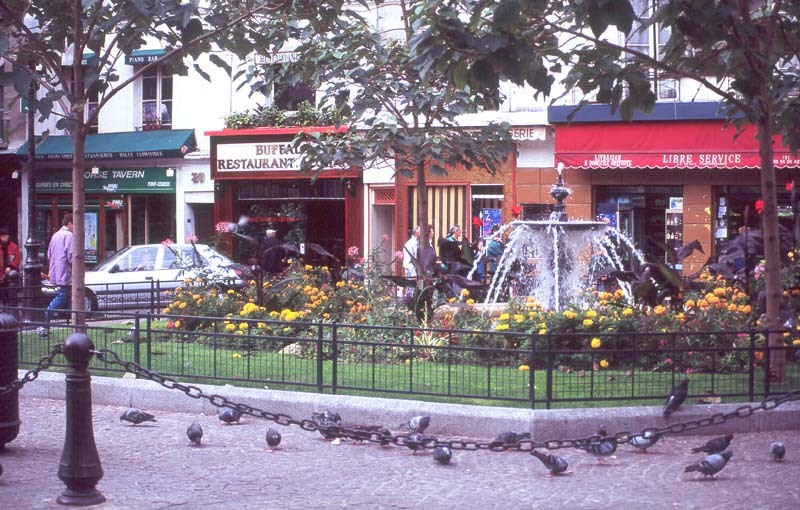 Continue on the tour from the Place de la Contrescarpe by walking down the rue Lacépède to the rue Monge. Cross the rue Monge and turn left. 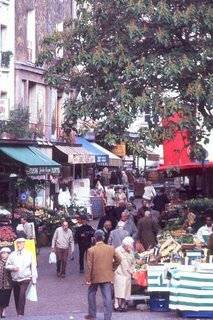 You should now be walking along the right-hand side of the rue Monge back toward the river. After crossing the small rue de Navarre, you will find, on your right, an entrance to the Arènes de Lutèce, the remains of the Roman amphitheater (there is also an entrance on the rue de Navarre itself). Now a park (and often a makeshift soccer field for neighborhood kids), the amphitheater’s foundation blocks, stage, and some seating rows are clearly visible. The ruins were rediscovered in the mid 19th century during the construction of the rue Monge and excavated to its current state in the early 1900’s. 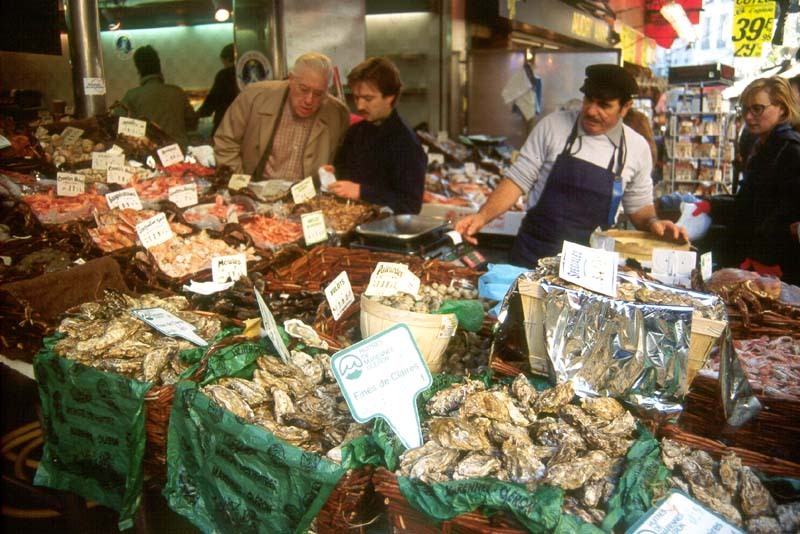 Marchand de coquillages et crustacés. 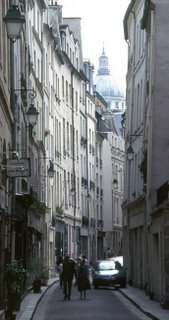 Back on the rue Monge, continue toward the river. 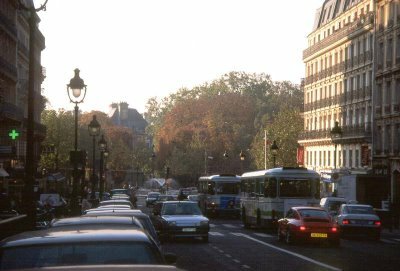 Turn right on the rue du Cardinal Lemoine and walk to the rue des Ecoles. On your right rises the Faculté des Sciences at Jussieu (seen with the Panthéon at left), a modern complex housing the schools of letters, humanities, life sciences, and health (part of which is also known as the University of Pierre and Marie Curie). Built in the 1960s, the lifted podiums and squared plan of the complex stand in stark contrast to the surrounding neighborhood. The buildings were closed down in 1998 to allow for a renovation that includes the removal of asbestos. 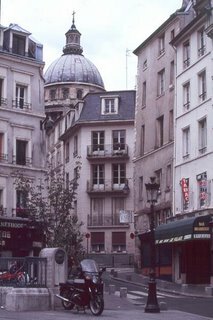 Turn back to the rue des Ecoles and continue to where it intersects the rue Monge. Turn right and walk to the intersection with the Blvd. St. Germain. You will be in the Place Maubert, essentially an intersection, but also the home of an outdoor market on Tuesday, Thursday and Friday mornings. 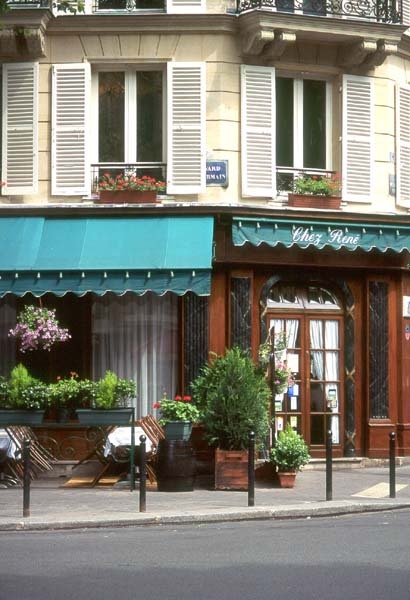 The Place is also lined with many bistros for a drink or a quick lunch. The Ecole Polytechnique as seen from the Quai de la Tournelle. A great traditional restaurant on the Blvd. 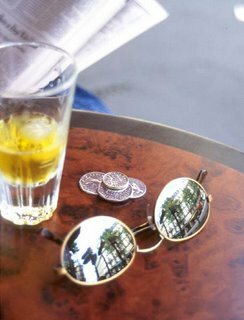 St. Germain. Statue of 16th century essayist Michel de Montaigne on the rue des Ecoles. From here you can dive back into the heart of the Latin Quarter and explore the network of pedestrian streets lined with shops and eateries, primarily catering to tourists. 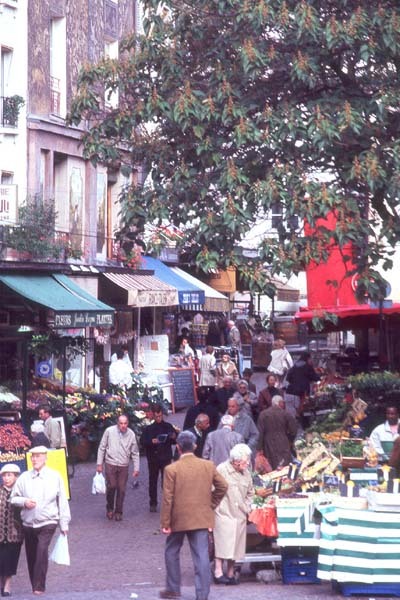 You will find the Théatre de la Huchette, where Ionesco’s La Cantatrice Chauve has played to packed houses since 1955, and the Shakespeare and Company bookstore among the myriad souvenir shops, shellfish restaurants and kebab stands. Along the river you will find the typical stands of the bouquinistes, or booksellers, in the shadow of the Notre Dame cathedral selling used books, magazines, records, and photographs. 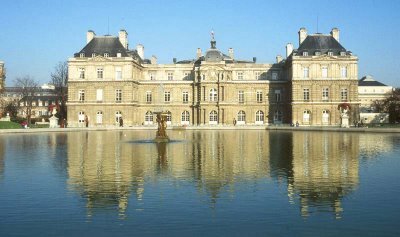 Or, you can head back to the Boulevard St. Michel and on to the Luxembourg Gardens for a leisurely (or not) stroll around the fountain and the grounds of the building that is now home to the French Senate. The home of the French Senate in the public Luxembourg Gardens. 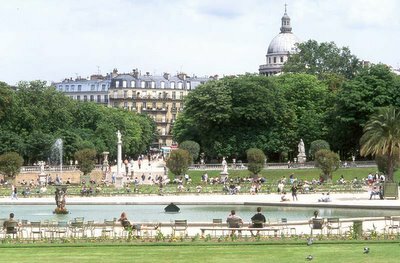 The Panthéon seen from the Luxembourg Gardens. Relaxing with a magazine in the Luxembourg Gardens. 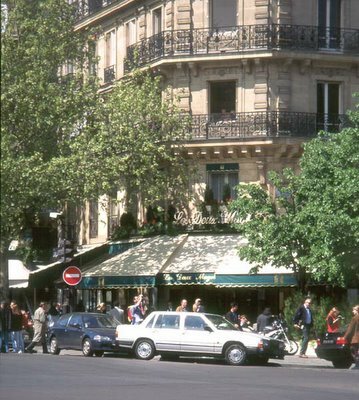 Or still, you could head up the Boulevard St. Germain to St. Germain des Prés for coffee and heady conversation (your own) at the famous existentialists’ favorite cafés: Les Deux Magots and the Café de Flore. Café Les Deux Magots in the St. Germain des Prés neighborhood. The Latin Quarter is the historic intellectual center of Paris. From here, the City of Light radiates in all directions. 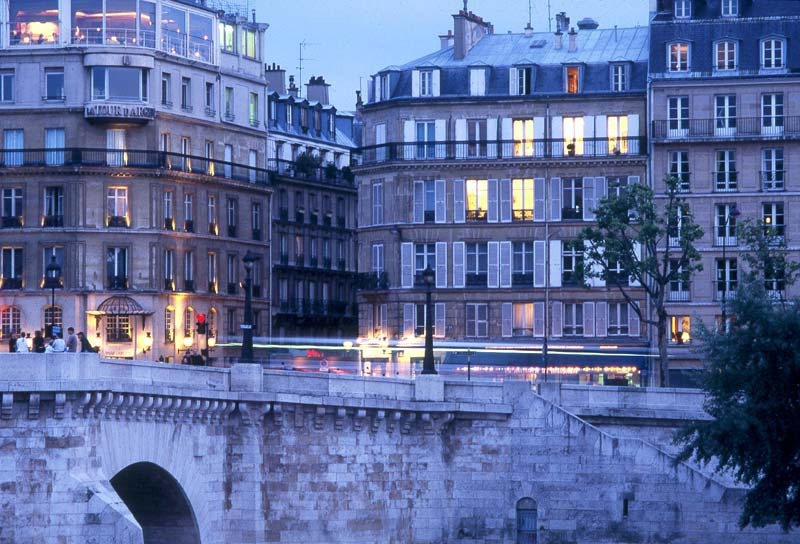 The famouns Tour d'Argent restaurant overlooks the Seine River and the cathedral of Notre Dame from the Latin Quarter. 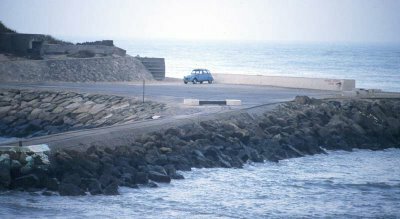 A blue Citroën "deux chevaux" sits all alone on the Pointe de Grave between the Atlantic Ocean and the Gironde in southwestern France. I took this picture in 1989 while crossing the mouth of the Gironde on a ferry to Royan. It was October, if I remember correctly, and it was not warm. 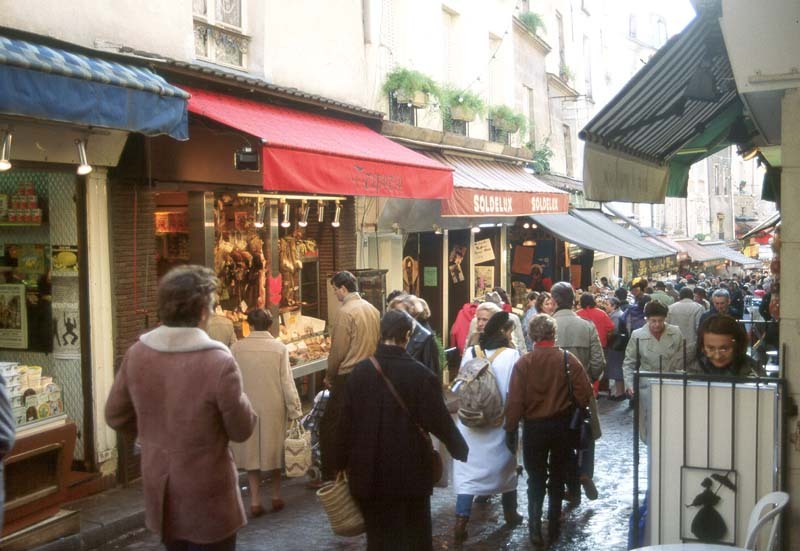 The Latin Quarter walking tour is coming this weekend!